I know it's hard to believe but holy cow, my tulips are all sewn together in rows! I know, I still have borders but wow! I've actually made progress. Yesterday I got up, made coffee and got down to business stitching those leaves and stems. Thank goodness NCIS was on tv, plenty to keep me in my seat and not wandering around the house or yard. Well let's face it, the heat keeps me from wandering the yard too much. I really like how the chain blocks alternate. Not going to lie though, I was so busy making sure my tulip block backgrounds were facing the same direction, I forgot that my chain blocks alternated by row! Lucky for me I noticed before I got very far! So what about you guys? Sewing or just enjoying the summer? There are a couple of fun sew-alongs going on right now, Lori has been killing it this summer, I think she's on her third? 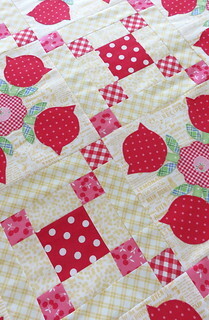 And Joanna's fans have a Jumping Jacks quilt along going! Both are sew tempting! Ok, time for me to get crackin! Those borders won't sew themselves. Pretty tulips and such a cheerful choice of colors! I love your tulips! I am trying to finish last year's scrappy trip around the world from last year! That quilt is to die for! Man, I love it SO much! Are you going to do a pattern? ACCKK! LOVE it! Your tulip quilt is just BEAUTIFUL! I still have it on my list to do in blue. I have to tell you though that I wish I had been able to buy 'yards' of your Pam Kitty Picnic Fabrics. I still want to do your lunch pail patten and your fabric is just going too fast in other projects. Thank you for such beautiful fabric and patterns. Love this very much, Pam! It is a gorgeous pattern and the colours are a delight. Lovely. I may have to get a tv for my sewing room. It is too easy to get up and go to another part of the house for a break. That's lovely, Pam. Good job! Very nice! Jan from Sew and Sow Farm sent me to say HI ! Kathy Davis from the MO Ozarks. I love the alternating chain blocks - and I see how easy it would be to mix them up. I'm missing working on my Jumping Jacks blocks but I'll get back to them next week with a vengeance! 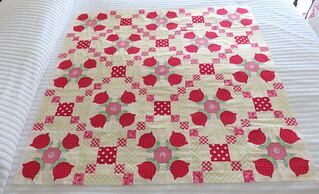 What a perfectly gorgeous quilt!